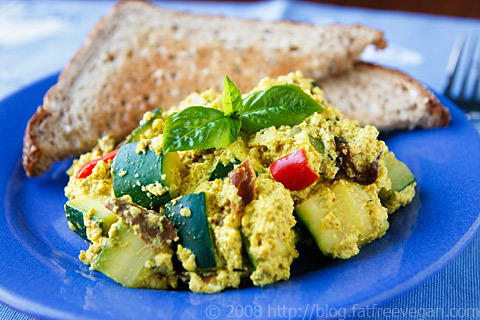 Scrambled tofu is one of my family’s favorite breakfasts, but I think we enjoy it even more for dinner. There’s something comforting about coming home at the end of a long Autumn day to a plate piled high with scrambled tofu, toast, and possibly some creamy grits and vegan sausage. It’s the kind of soothing meal I like to fortify myself with before a nerve-wracking night watching election returns. My scrambled tofu tends to contain about as much vegetables as tofu, making it a great way to get my daughter to eat her veggies without complaint. Everyone in the family has a favorite ingredient: my daughter insists that I add frozen peas to her portion, and my husband often requests artichoke hearts and tomatoes. But we all agree that it isn’t scrambled tofu without mushrooms. Recently, when we were all in a scrambled tofu mood but there were no mushrooms in the house, I got the bright idea to add some rehydrated porcini mushrooms and balance out the woodsy taste with some fresh basil. I wasn’t trying to be all fancy-schmancy, just get a comfort-meal on the table, but those ingredients, along with a few drops of truffle oil, really take scrambled bean curd to gourmet heights. If you’d like to use fresh mushrooms instead of dried, add about 4-8 ounces of sliced mushrooms when you add the zucchini. You can also substitute other vegetables for the zucchini and add a half cup of frozen peas along with the tofu. On nights when I’m running short on time, I’ve been known to skip the chopping and add a 1-pound bag of frozen vegetables to my tofu (Italian blend with broccoli, zucchini, and peppers is our favorite). Put the dried mushrooms into a bowl and cover them with boiling water. Allow them to soak until soft, about 30 minutes. Pour soaking liquid through a coffee filter and save it for another use. Remove mushrooms from filter, rinse, and chop into bite-sized pieces. While the mushrooms are soaking, chop the bell pepper and cut the zucchini into cubes. Mix the seasoning ingredients in a small bowl. Mash the tofu with a potato masher or crumble it with your hands. Heat a large, non-stick skillet over a medium-high burner and add the green peppers. Sauté for 2 minutes. Add the zucchini and garlic and sauté for another minute. Add 2 tablespoons of water, cover, and cook until the zucchini is softened, about 4 minutes. Add the mushrooms, tofu, and seasoning mix and stir well. Add the truffle oil/water mixture or plain water. Stir well, turn heat to low, and cook for 5 to 10 minutes. Test seasonings, adding more salt if necessary. Serve hot. Makes 4 servings. Per serving: 176 Calories (kcal); 6g Total Fat; (28% calories from fat); 16g Protein; 16g Carbohydrate; trace Cholesterol; 472mg Sodium; 6g Fiber. Weight Watchers Core / 3 Points. We have a simplified version of this almost every Sunday. It is just sliken tofu, mushrooms, spring onions, turmuric, lots of dill and salt and pepper. Great on a Bagel! Aye, but that be an interesting mix there! Mayhaps I’ll try it next week! My scramble uses curry powder (my own blend), a sprinkling of prepared yellow mustard and lemon juice, purée some zucchini and onion, then chop some criminis and toss in a half-n-half mix of Daiya brand cheddar and mozzarella and serve over a tortilla. What do you use the cornstarch for? Just a thickener? Would you recommend anything else as a substitute? I’m a bit sketchy with corn-based products these days – some days I’m fine, other days not so much. Probably a slight intolerance, most likely due to our wonderful friends at Monsanto. Yes, it’s just a thickener. You could substitute another starch (like potato starch), but I think it’d be fine if you left it out. I’m intrigued by your recipe, especially the pureeing of the zucchini and onion. I never would have thought of that. I was wondering if you have any suggestions on some of the recipes for a serving size of 1 to 2. I live by myself and find so many of the recipes to be great ideas to add to my diet plan but they are larger servings than I need. Or if some one could be so helpful in letting me know how I can convert the current recipe to a smaller amount. Thanks in advance. I was just wondering if you have any suggestions on where to find black salt. Is it the same thing as black lava salt? Sounds so interesting. Thanks! No, black lava salt is totally different and usually more expensive. If there’s an Indian grocery store near you, it should have a bag of black salt big enough to last a lifetime for a few dollars. Other than online, that’s the only place I’ve found it. I just made this for breakfast and OMG! So good! I had to use shiitake mushrooms and I didn’t have any truffle oil but it was still amazing!! Thanks! I’m sitting here eating this awesome tofu scramble for dinner and so grateful to you for this recipe. It’s one of my staples. I just love it. The spice mixture is genius! I make it up in bulk, omitting the nutritional yeast, cornstarch and black salt. Then, when I’m making this recipe, I add one tablespoon plus one teaspoon of the dry spice mixture to the nutritional yeast and cornstarch. I hope you see a new question on your yummy 10 year old post! Have you ever tried batch cooking this or any of your scrambled tofu recipes so you can have them later for a quick reheated breakfast? Thanks. 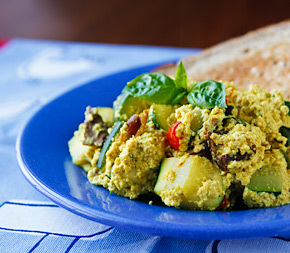 Hi Lori, I haven’t tried batch cooking scrambled tofu, but I’m sure it will double or triple easily, and scrambled tofu itself will keep in the fridge for a week or two. The vegetables in the tofu may not be as fresh-tasting after so long a lime, so it might be best to cook them separately and add them together when serving. The same goes for freezing—the veggies don’t fare as well in the freezer as the tofu.